We see different types of plants around us. Plants are living things. They breathe and grow. They also reproduce. Most of the plants grow on land. Some plants grow in water. Plants are very useful to us. Some plants are big and strong. Some plants are small and weak. Tall, big and strong plants are called trees. The stem of a tree is called the trunk. Trees give us shade, fruits and wood. 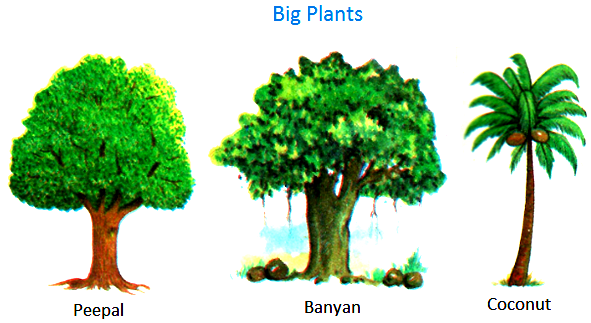 Peepal tree, banyan tree, coconut tree, etc., are big plants. Small plants are smaller than trees. Their stems are thinner and weaker. They need lesser space to spread. They are not very tall. Shrubs, herbs, climbers and creepers are small plants. Shrubs are smaller than trees. They have small, thin, hard, woody stem and many branches. These branches grow close to the ground. They are medium in size and they live for several years. 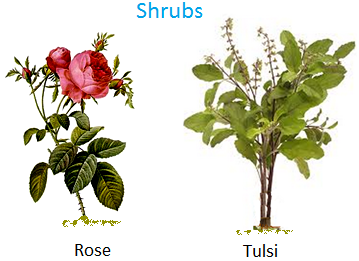 Rose, tulsi, jasmine, hibiscus, etc., are shrubs. Some small plants have soft and green stems. They are called herbs.Most herbs live only for a few months. Grass, mint, wheat, sunflower, lady’s finger, etc., are herbs. Herbs are smaller than shrubs. They have soft, green and thin stems. They can stand erect on the ground. They are seasonal plants. Stems of some plants are weak. They cannot stand erect on their own. They need the support of another plant or sticks to stand. Those plants are called climbers. Climbers have tendrils to hold the support. 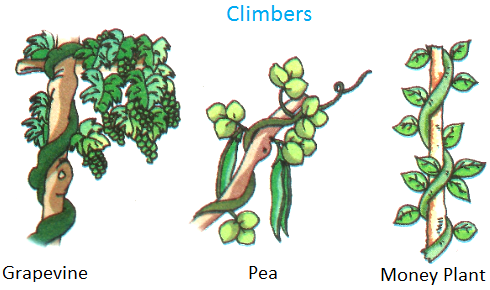 Grapevine, pea, money plant, etc., are climbers. Some plants crawl along the ground. They are called creepers. Pumpkin, water-melon, bottle gourd, etc., are some common creepers. Some plants have thorns. Animals do not eat such plants. Such plants are called thorny plants. 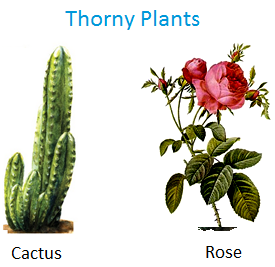 Some thorny plants are cactus, rose and bougainvillea. Some plants grow in water. They are called water plants. Water lily, lotus, water chestnut, etc., are water plants. Most plants have leaves. Leaves are of different sizes and shapes. Leaves are important parts of a plant. Some plants have big leaves. Papaya, lotus, banana have big leaves. Some plants have small leaves. 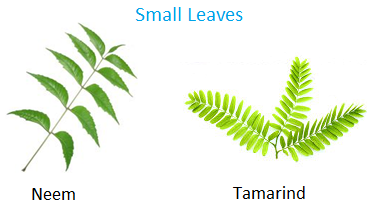 Neem and tamarind have small leaves. Leaves of most plants are green in color. They prepare food for plants. Some plants like banyan tree and neem tree live for hundreds of years. Some plants like pea, sunflowers and rice live only for a few months.